Pictures of sunflowers always make me feel cheerful and remind me that summer is on its way (at least, here in the Southern hemisphere). 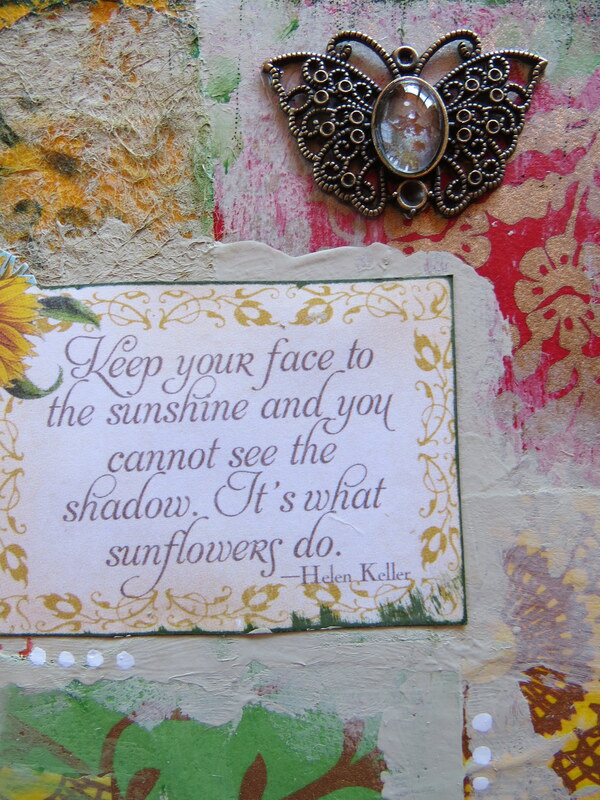 Even in winter, the sight of a sunflower image can lift the spirits and conjure up feelings of warmth and happiness. 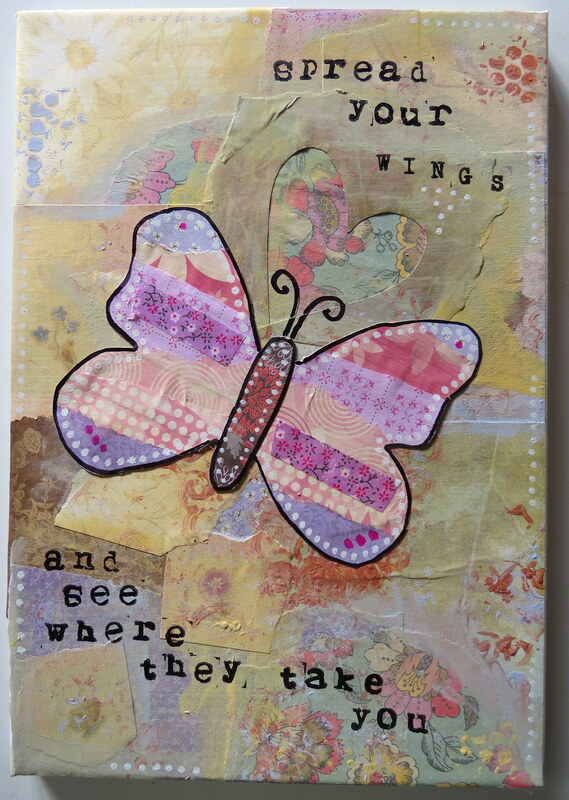 I made this small mixed-media canvas using papers from Rosie’s Studio handmade paper scrap pack. 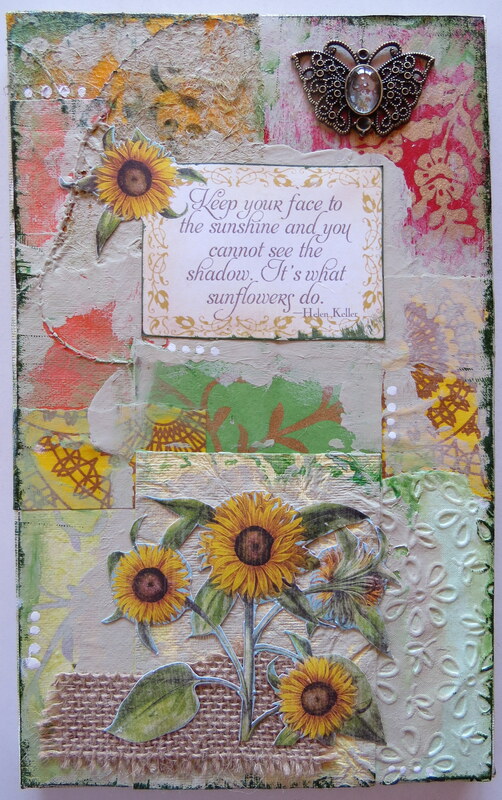 The quote and the sunflower images are from Graphic 45’s Time to Flourish collection. 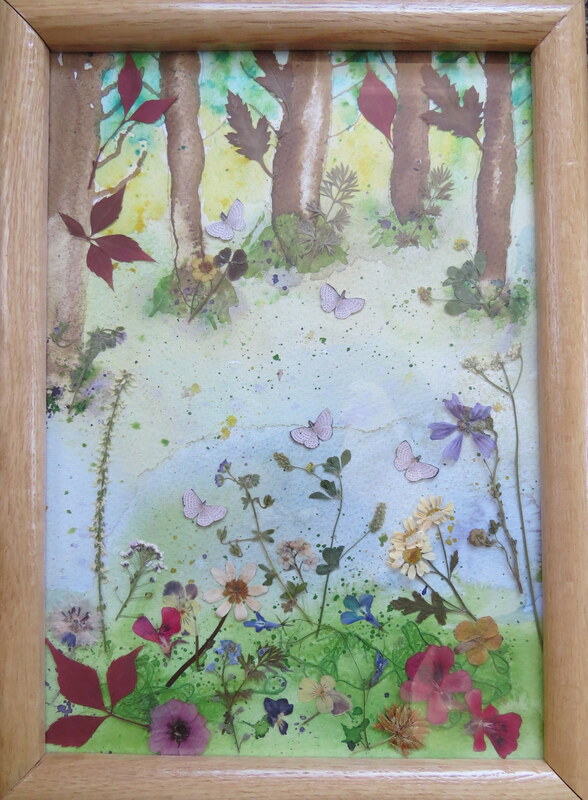 I used acrylic paints and inks, and added a piece of burlap and a small metal trinket. 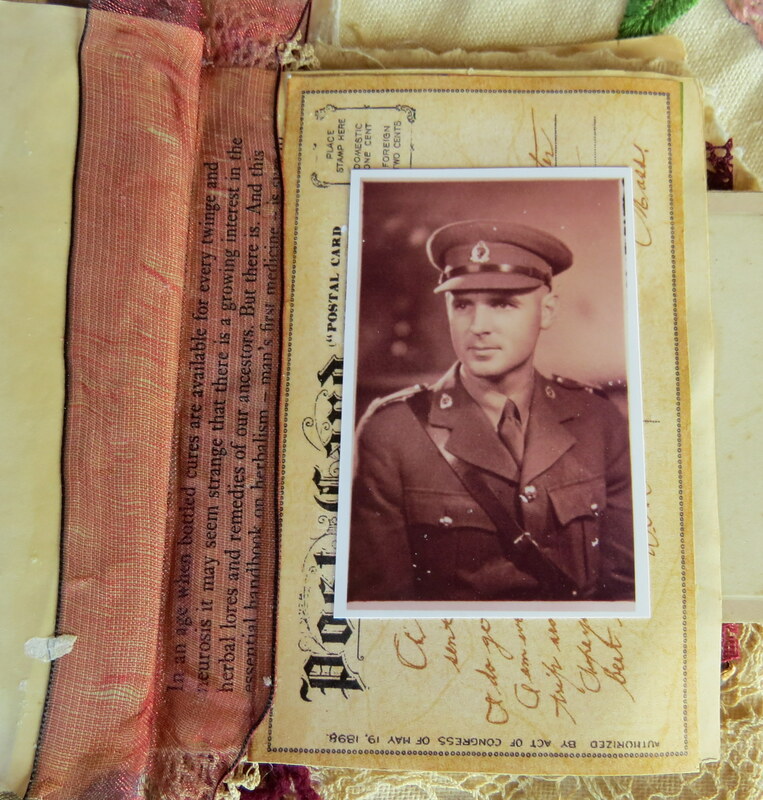 Here are some close-up views. 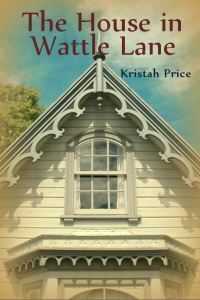 As a book lover and a crafter, I have quite a large collection of art and craft books on my bookshelves. I love browsing through them. 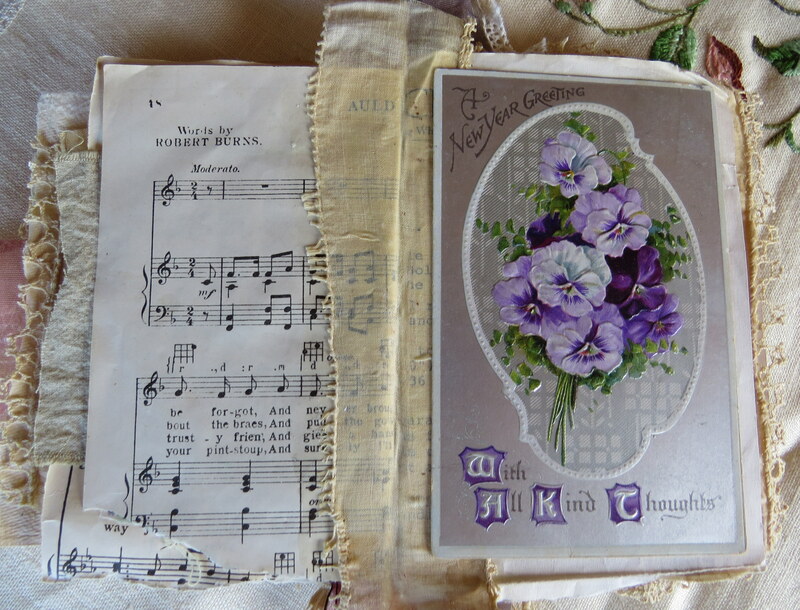 Each one provides me with inspiration for my own craft projects, as well as teaching me new techniques. 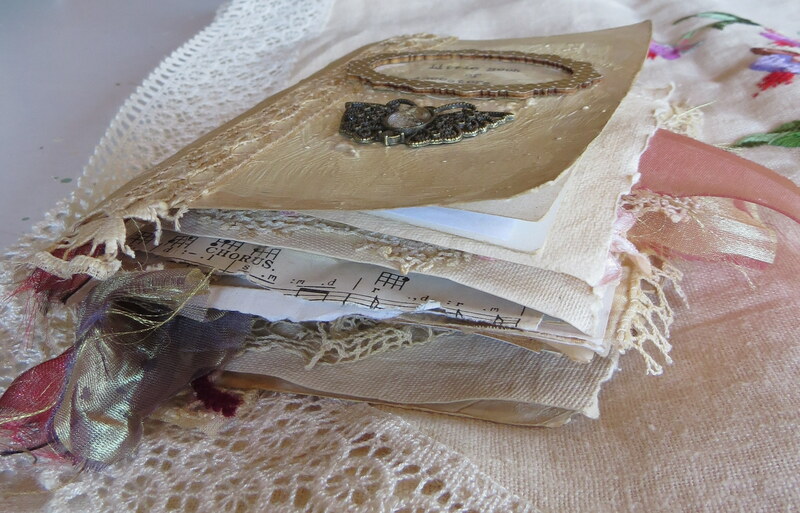 These are a few books by my favourite mixed-media artists. 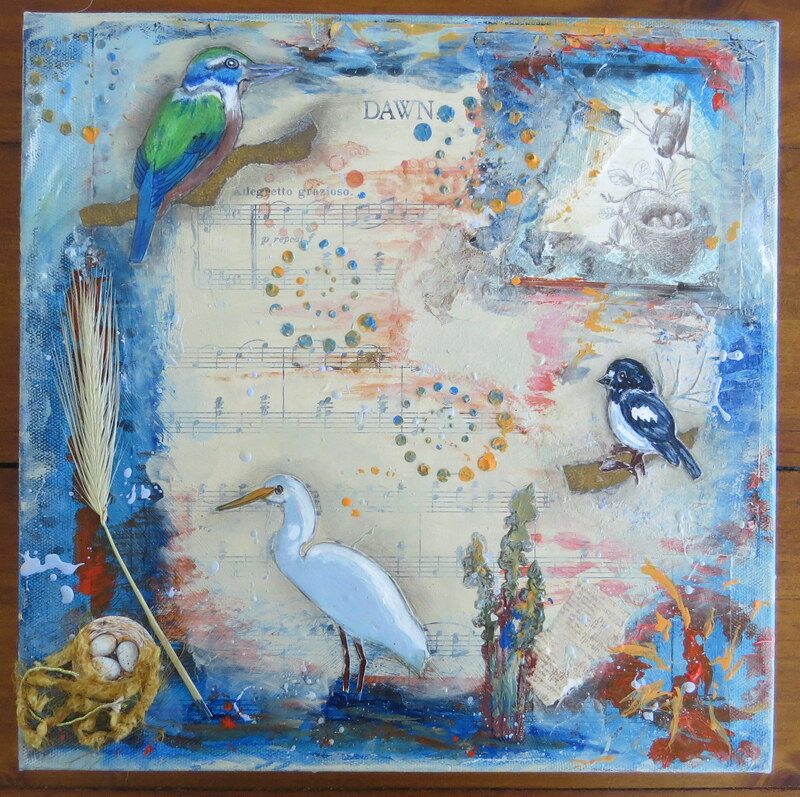 Suzi Blu was the first mixed-media artist I ever discovered. 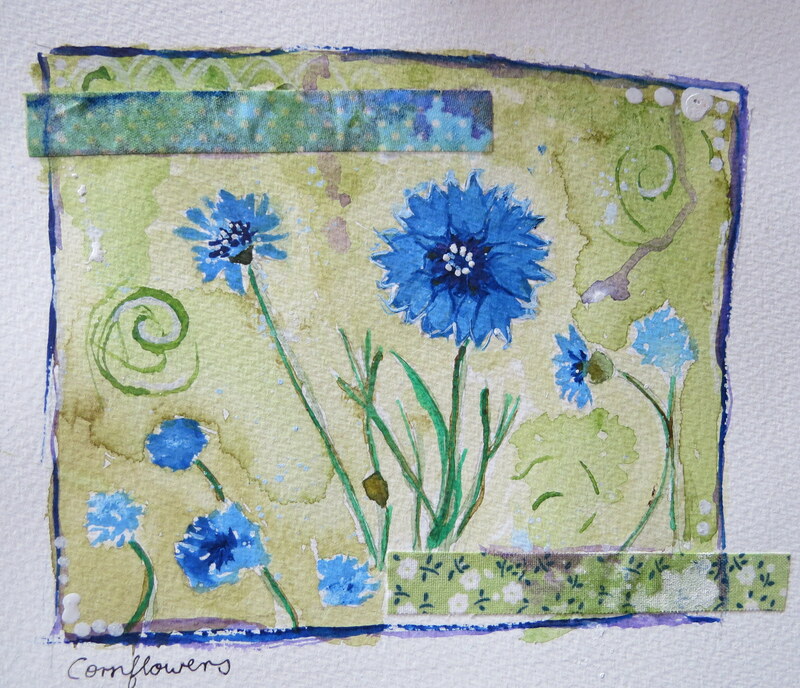 I fell in love with her charming mixed-media girls and her gypsy boho style of art. 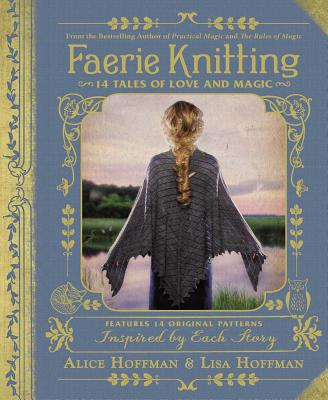 When her book came out I immediately bought it, keen to learn her techniques and to see more of her lovely creations. 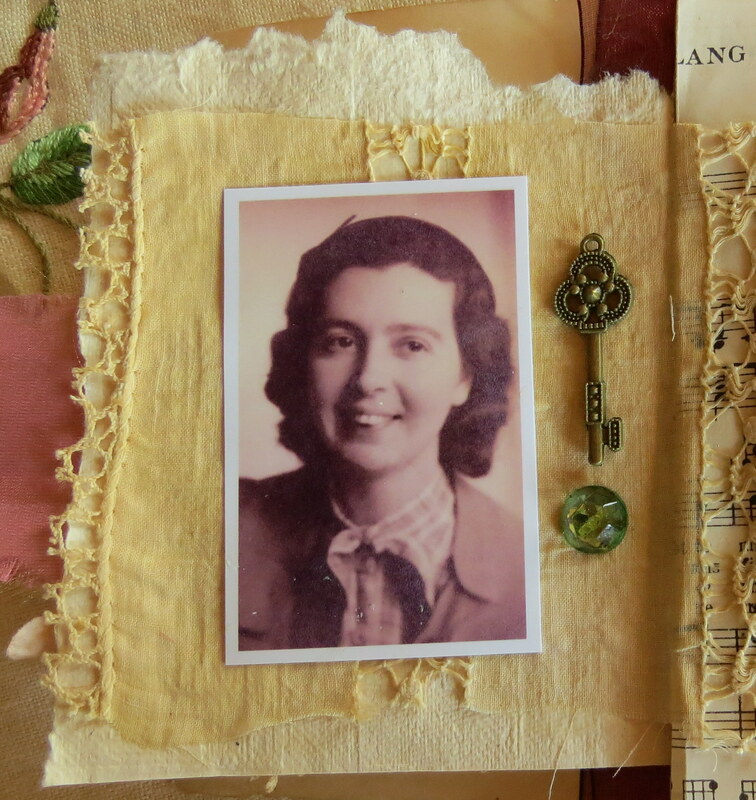 It was her book that provided inspiration for my first foray into the world of mixed-media art. 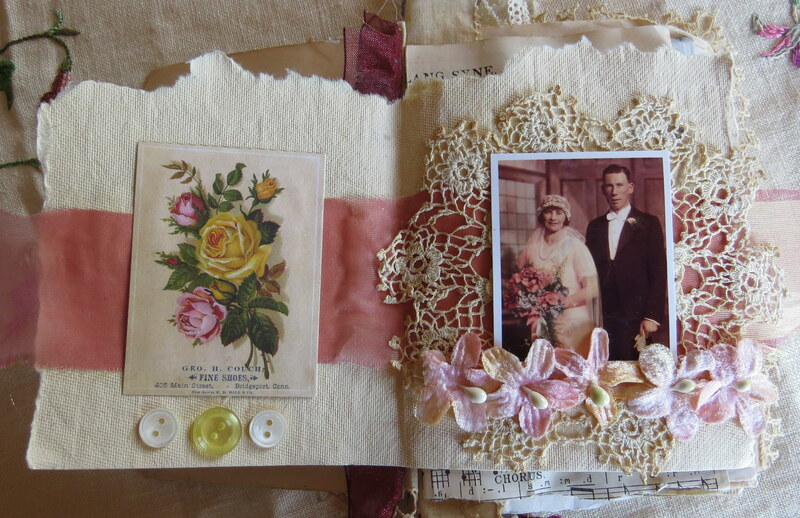 She also introduced me to the wonderful world of art journaling. 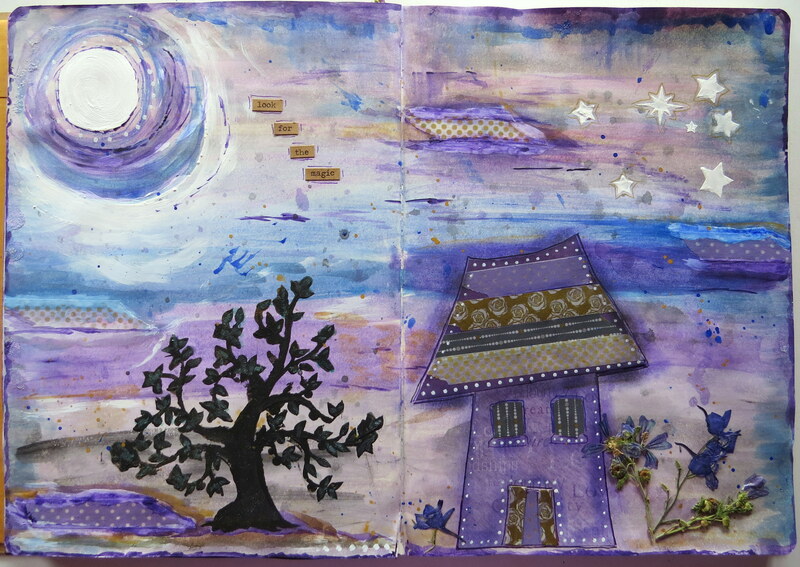 I took one of her art journaling courses and discovered a whole new way of expressing myself creatively. She has many videos on YouTube and offers lots of courses on her website. 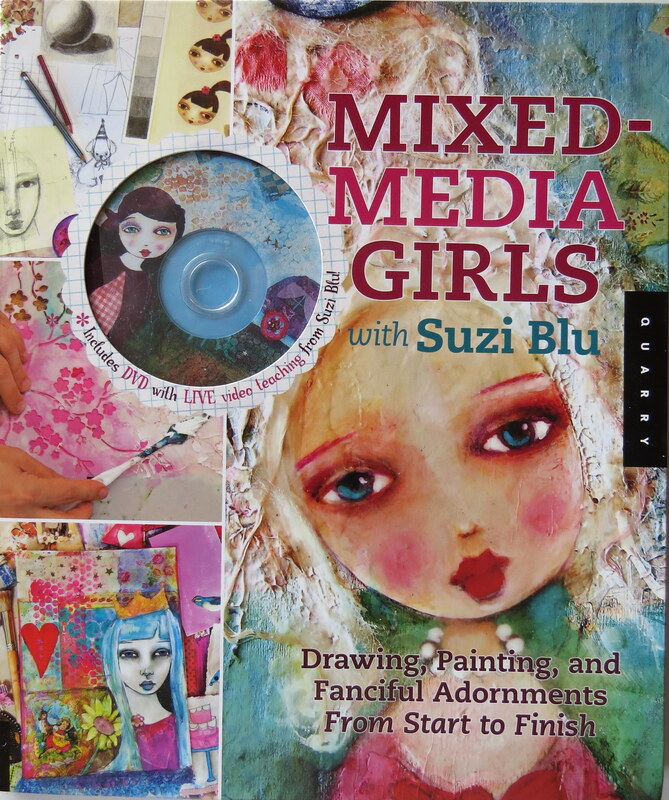 Mixed-Media Girls with Suzi Blu includes instructions for drawing and shading a pretty face and folk art body, lots of step by step projects, and a gallery of artwork by her students. 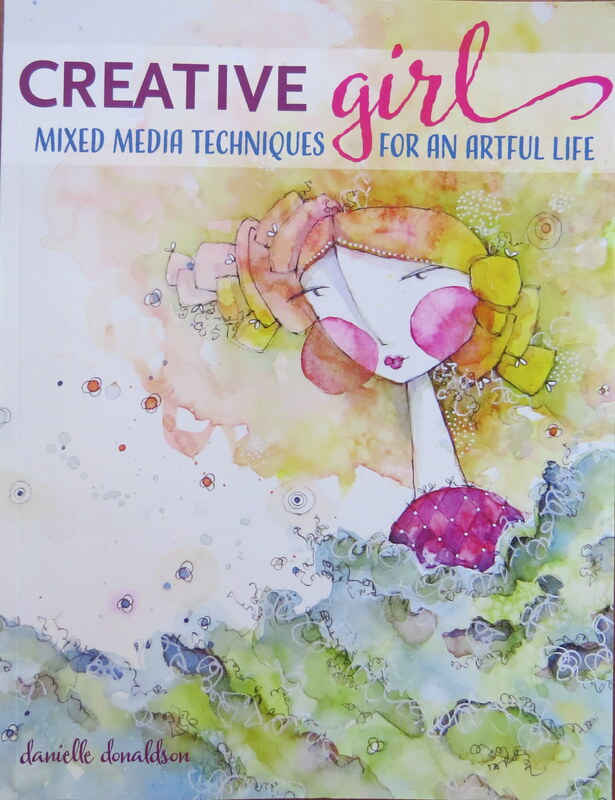 It also comes with a bonus DVD on which Suzi guides you through drawing, painting, and finishing one of her mixed-media girls, presented in her fun, quirky style. 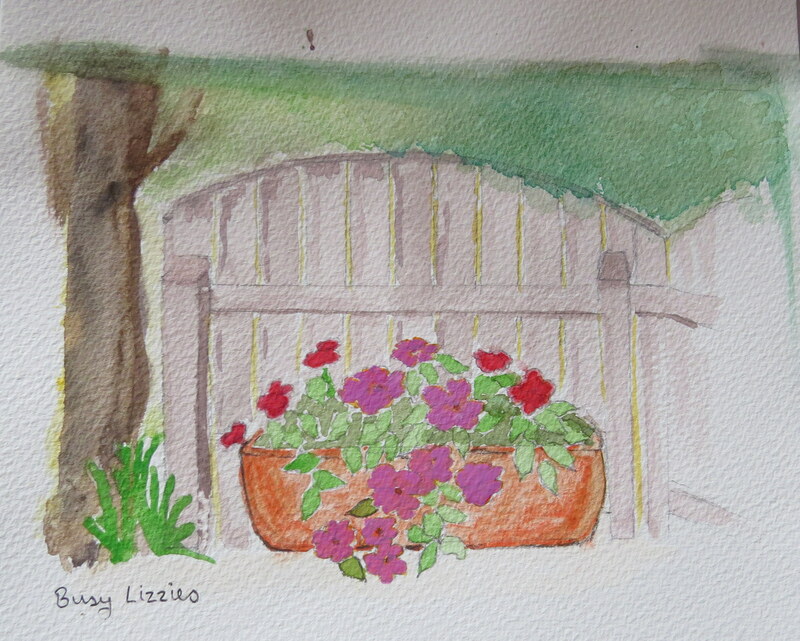 This is the book that began my love of watercolour painting. 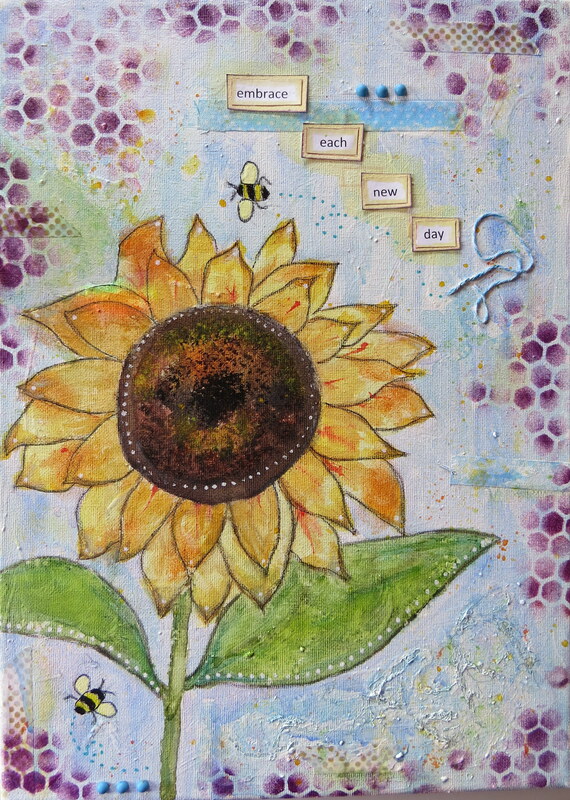 Danielle Donaldson paints lovely whimsical watercolour illustrations and her distinctive style of art includes a range of mixed-media elements. 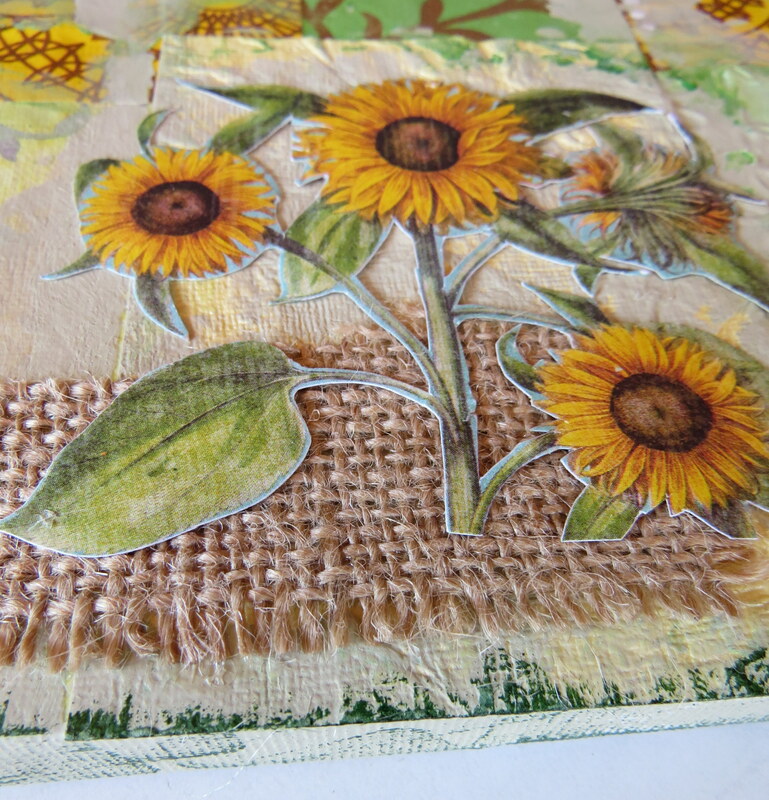 Her book teaches basic watercolour techniques and fun ways to incorporate mixed-media elements such as stitching, collage, and layering, into your projects to tell visual stories. 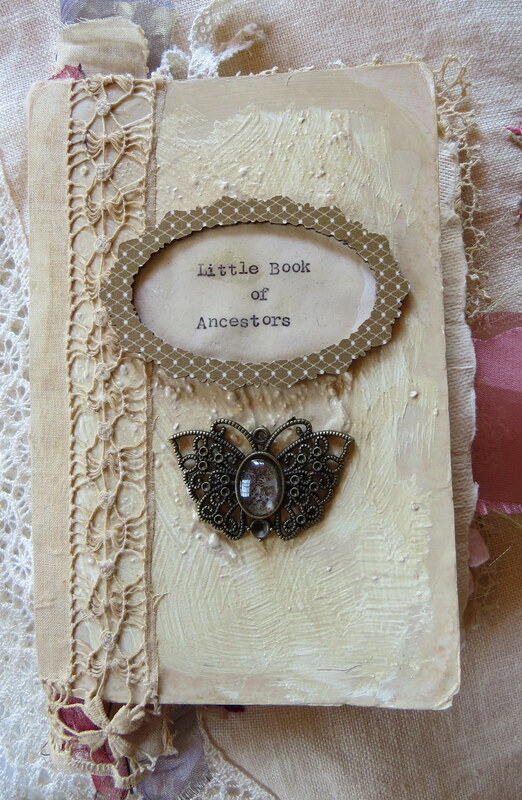 At the back of the book there is a small gallery of some of Danielle’s work. As a young child I loved playing with paper dolls and was so excited whenever I received a new one for my birthday or Christmas. I would spend hours cutting out the clothes, folding the paper tabs over the cardboard dolls, and making up stories for them to act out. I still have all of the paper dolls from my childhood and take them out every now and then when I am feeling nostalgic! 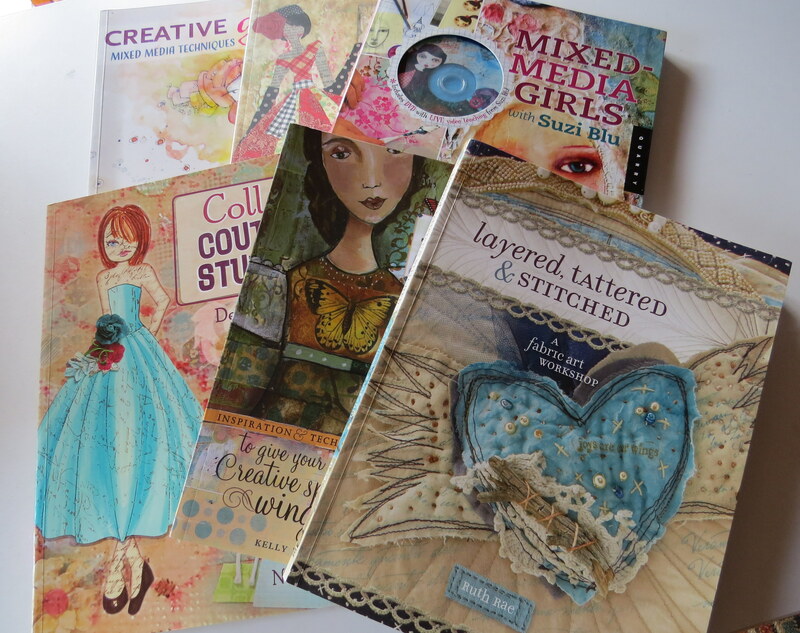 Naturally I was thrilled to discover Julie Nutting’s two books, Collage Couture: Techniques for Creating Fashionable Art, and Collage Couture Studio Paper Dolls. 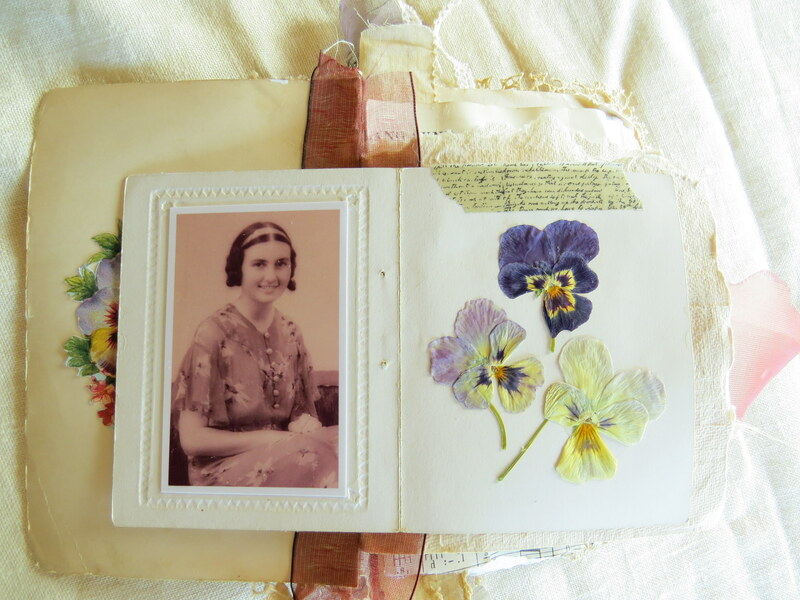 It was a chance for me to rediscover those magical childhood memories, and to combine two of my favourite things, paper dolls and pretty scrapbook papers. 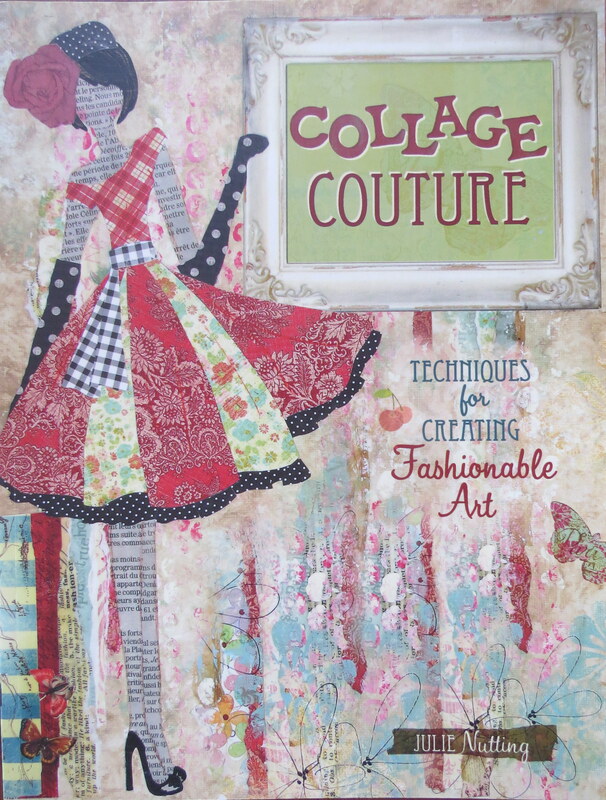 Collage Couture: Techniques for Creating Fashionable Art teaches you how to sketch fashion figures and create stylish dresses from patterned papers, and it has step-by-step projects for creating mixed-media backgrounds for the dolls. Great fun! 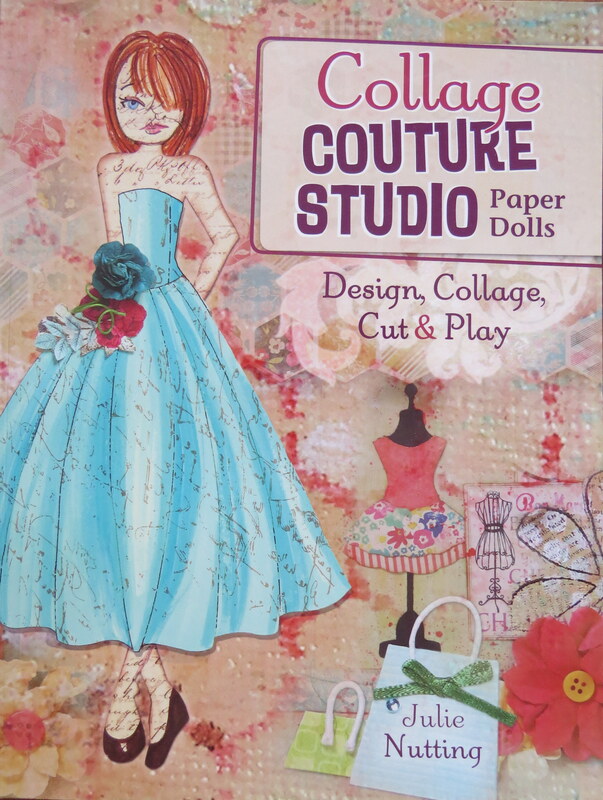 Collage Couture Studio Paper Dolls has five paper dolls from around the world, each with their own little story and a page of clothes in their own style, which can be photocopied or scanned and cut out. 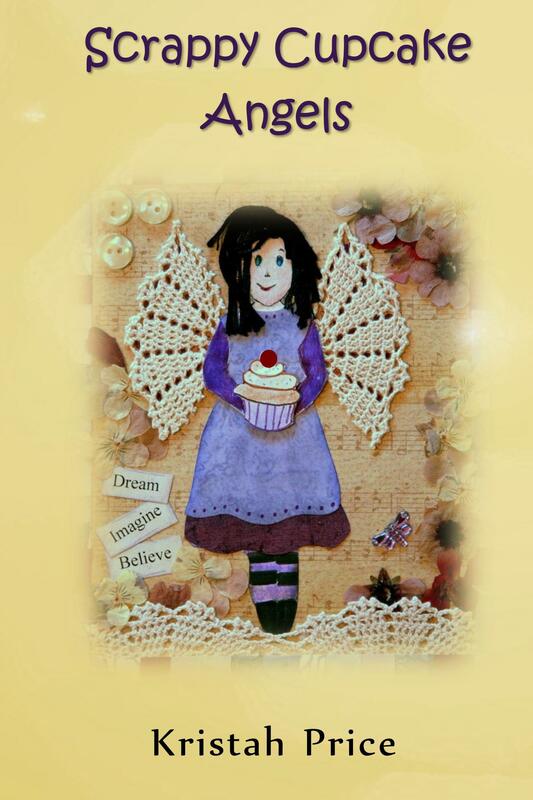 There is also a template for designing your own paper doll, and step-by-step projects for building mixed-media backgrounds and settings for the dolls. 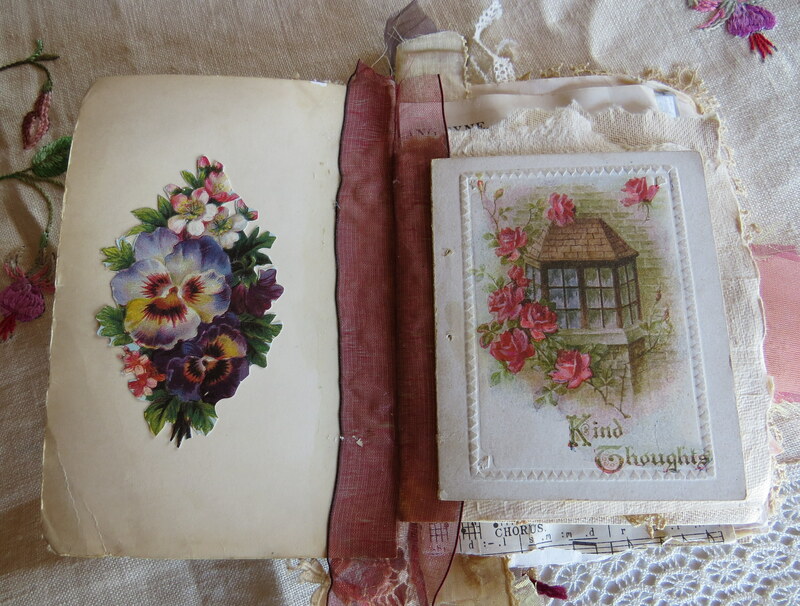 It was through this book that I first discovered Kelly Rae Roberts. 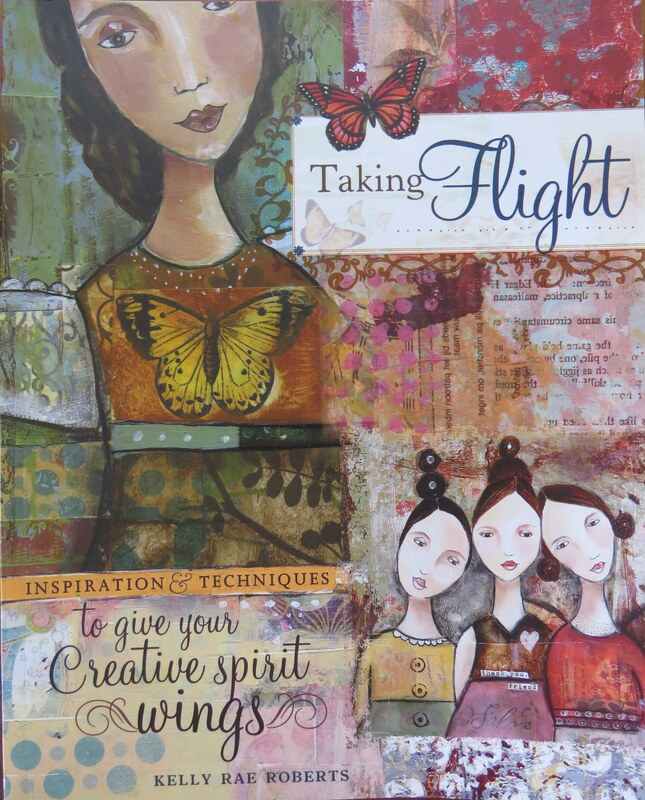 In Taking Flight, Kelly Rae shares her personal journey towards becoming a full-time artist and inspires you to rediscover your dreams and live a more creative life. 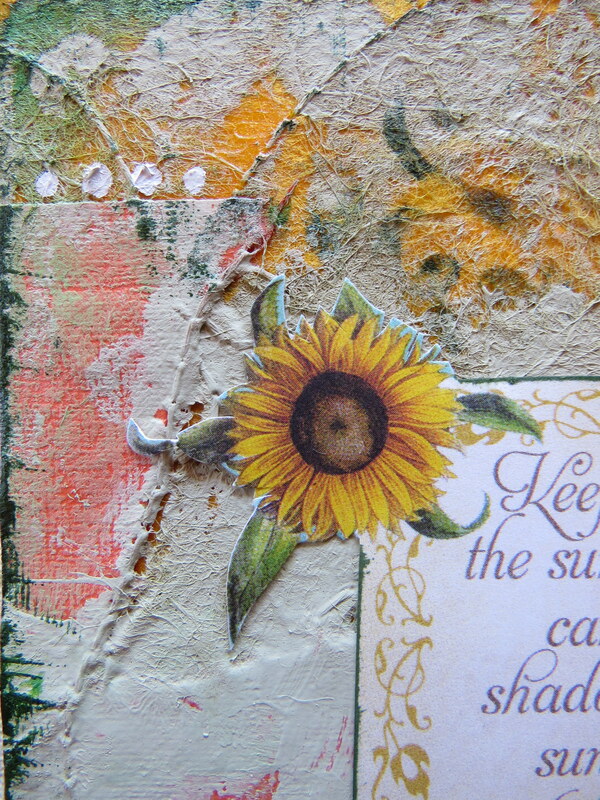 She shows you through step-by-step projects how to create mixed-media backgrounds, using collage and other techniques, and how to draw and paint faces. 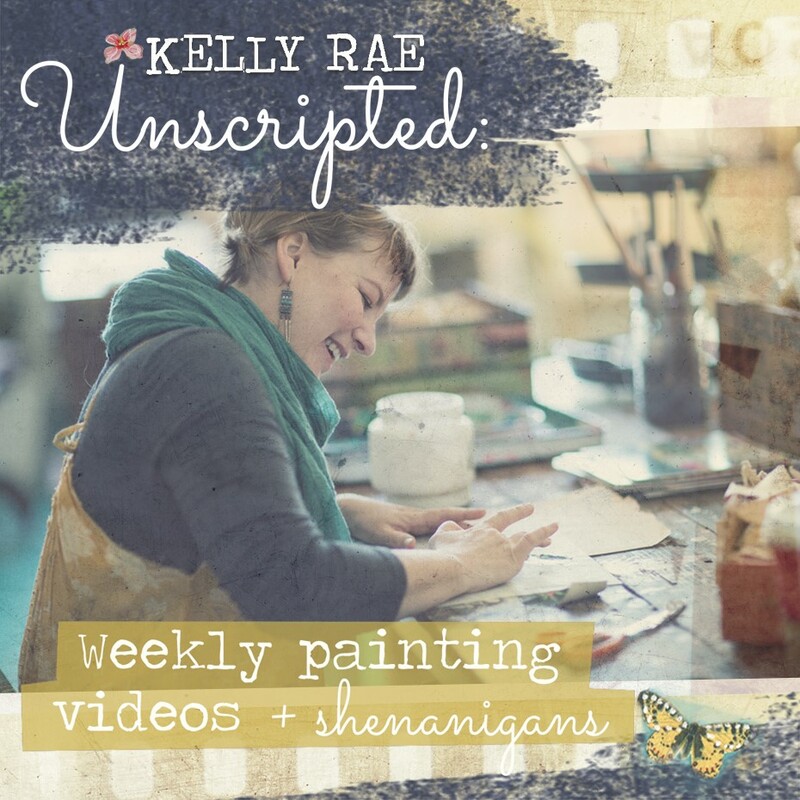 As well as teaching through her own recognizable style, the book also includes techniques from contributing artists, which Kelly Rae incorporates into her projects. 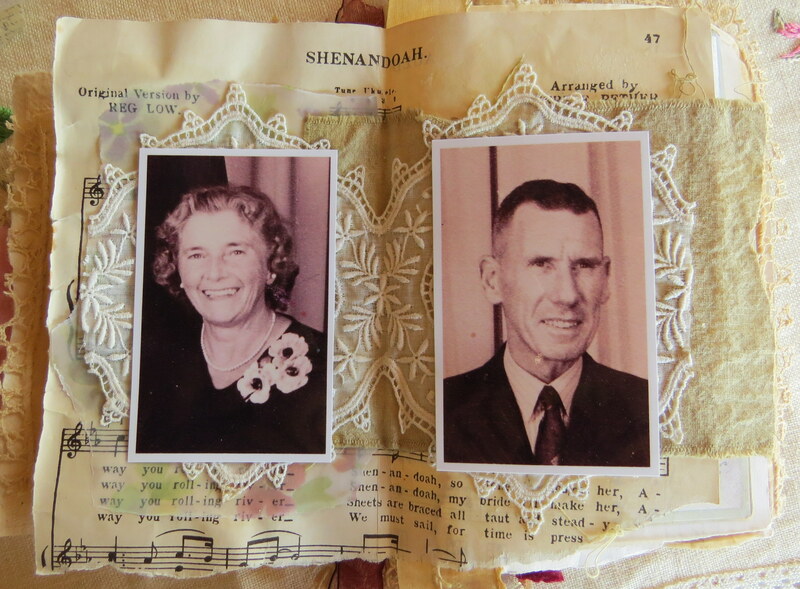 At the end of each chapter is an interview with the contributing artist. 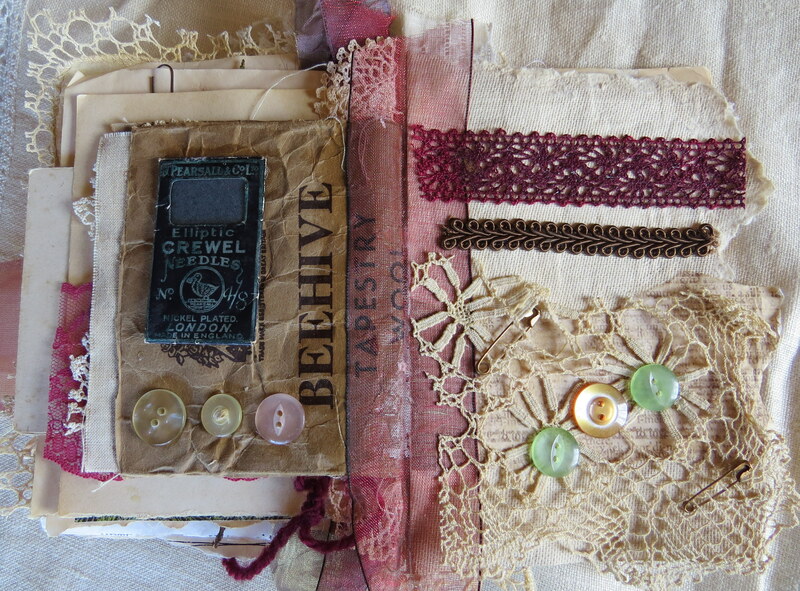 As well as having a love of scrapbook papers and embellishments, I also adore fabrics, lace, beads and buttons. This book indulges my love of all those things. 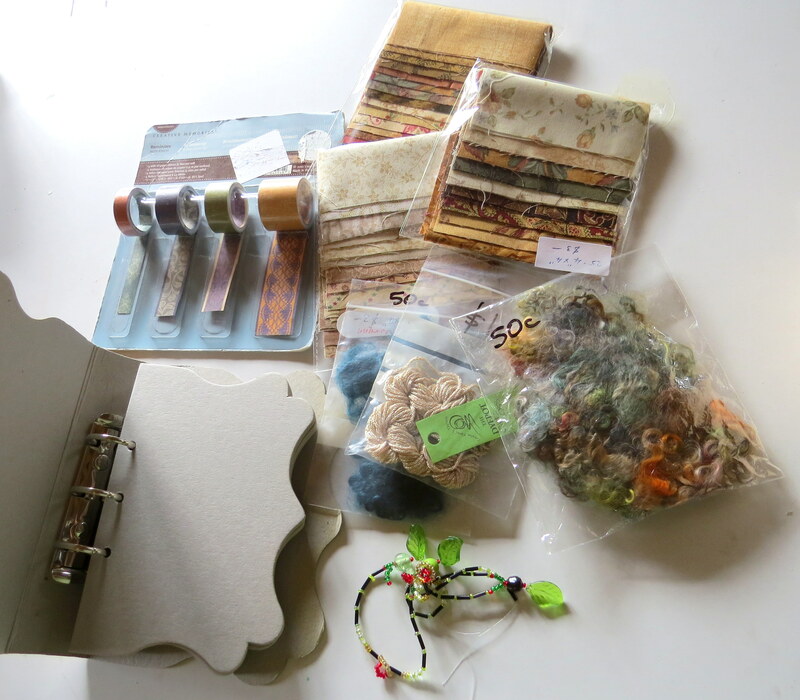 Layered, tattered & Stitched: A Fabric Art Workshop by Ruth Rae is full of inspiring small projects with step-by-step instructions for making fabric cards, books, journals and albums, art dolls, wall art, and much, much more. 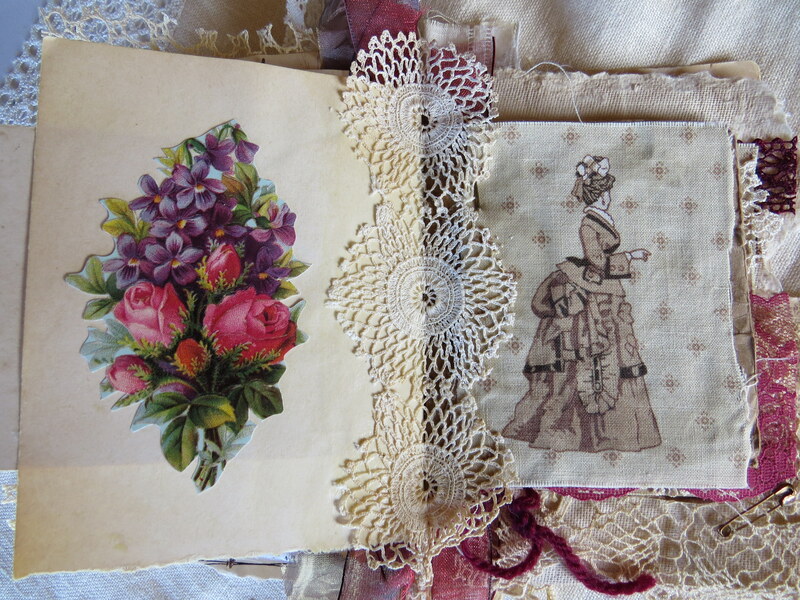 The book explores a range of sewing techniques combined with collage, photo transfers, dyeing and staining fabric, using wire, and more. 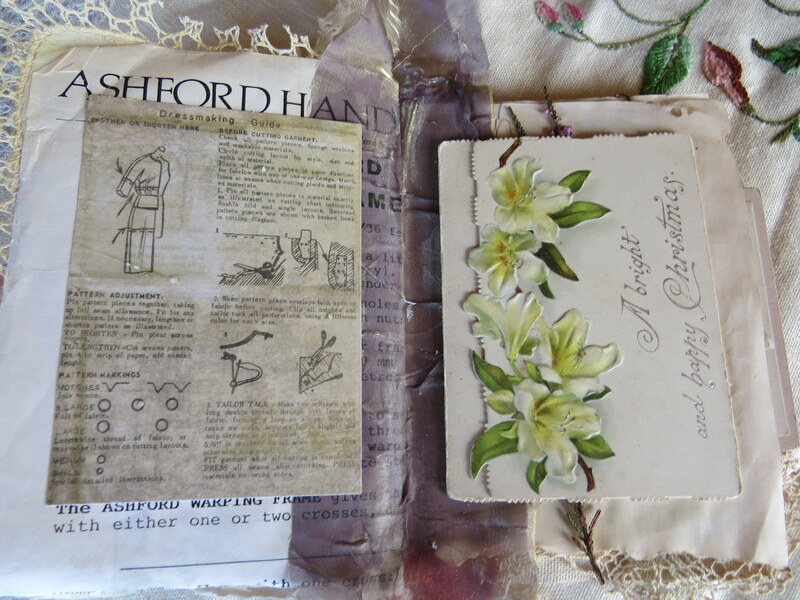 At the back of the book there are pattern templates for some of the projects. 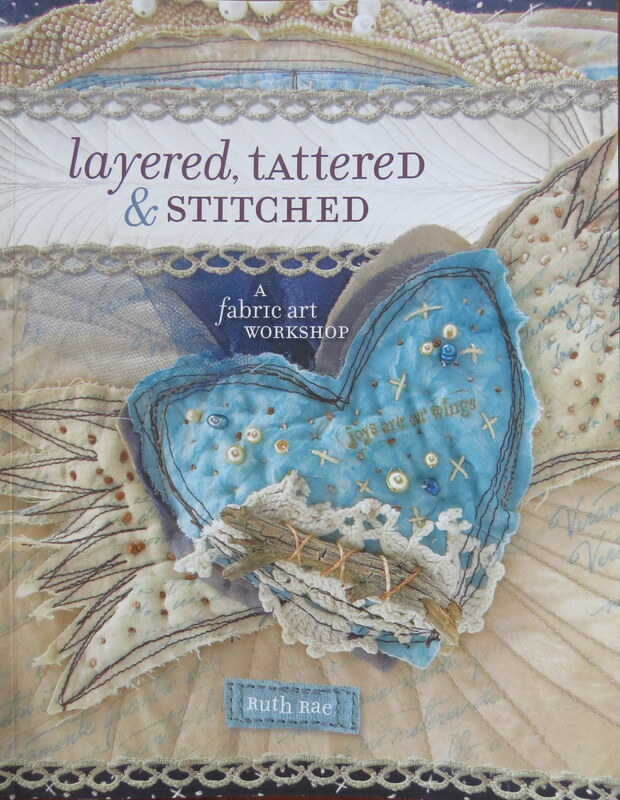 A lovely book for anyone interested in fabric art.